Mothering never seems to be far away. The desire to be mothered, the act of being a mother, let alone the sensation of realising you are being held by Mother Earth. I once worked in an office that had a fully equipped kitchen and was leading a team that worked incredibly hard in a very challenging environment. I regularly got to work early and baked muffins and had the coffee going for when the rest of the team arrived. They reported to me that coming to work on those days with the waft of fresh baking and the warmth of the oven helped them anticipate a ‘good day at the office”. It often wore off quickly as we faced crisis after crisis – but we faced it together – fed and watered. The other side of the wall to our office was the team that were often the source of the crisis or had the knowledge to help us address the crisis. The day we all came to leave their leader told me how much his team envied us with our home-made muffins and that my nickname was “earth mother’. I was shocked – almost appalled – here I was thinking my actions were a sign of being a wise General feeding my troops, making sure they had enough fuel to get them through the next battle. They other side of the wall, saw me as Earth Mother nurturing and caring! So for those who know the enneagram, you won’t be surprised when you learn that I am an 8. When I came home one night last week, the house was full of smells of pasta, tomato, garlic, chilli and herbs. One of the children had arrived and was cooking dinner. His first cooking adventure was lentil soup when he was 4. It was delicious and I felt very nurtured and loved. 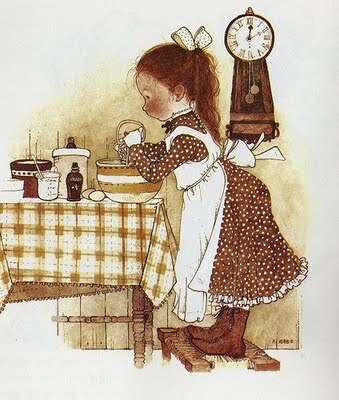 In the home the children grew up in I had a Hollie Hobbie picture that my mother had given me from a women’s magazine. It said: When its someone you love your food will be greeting, the joy is in the cooking as well as in the eating. I was glad he had learnt this lesson in our kitchen all those years ago. This past week I was worried about a woman heading into her final stage of pregnancy. For weeks now I have watched her huff, puff and find ways to move that will keep her comfortable. I instinctively knew her baby wanted her to slow down or even better still stop so it too could catch its breath and do the last bit of growing in a more still and staid state. Eventually the baby took his mother into his own hands, and demanded attention, insisting that stopping was essential. She listened and stopped and I was relieved. My maternal instinct was riding high. The passenger in her body spoke clearly and loudly. When a child acts in ways to demand your attention to ensure you can’t miss the meaning, it has been a very humbling, in my experience. Over the years, I have had that moment more than once, when I have had to be still to fully focus on what was happening to me as a result of a child demanding my full attention. The 4 year old lentil soup cook, was also the impossible teenager and broken young man and now the 30 something pasta perfectionist, happily making steps to create his own family. This is a gift of motherhood to know the child within you – even when the child has long left the womb – connects in such a way to you that causes you to stop so the shape shifting can occur for you both to be one again. There have certainly been times in my mothering when I wanted to completely disconnect, but that invisible umbilical cord, is never fully severed. I am reminded in these reflections Hildegard of your mothering in the Abbey – the young ones you yearned to come to live with you, your heart break at the ones who left you and your delight in the harvest of their lives as they found their home in you, the Abbey and your God. Your deep appreciation of the Motherhood of God. You weren’t afraid to embrace the idea of God as Mother and the earth as mother. These days I am settled with how others might notice and define my motherhood and mothering – whether that be as a General or some incarnation of mother earth in the kitchen or staff room. Being motherly and a mother has come very naturally to me, and I find that my mothering is not dependent on biology, but it is dependent on my sense of feeling grounded in both heaven and earth – a cosmic and practical phenomena that puts my humanity in the middle of these two realms. mother of all that is human. are the seeds of all. This entry was posted in Uncategorized and tagged Enneagram, Holly Hobbie, Mothering, muffins, Parenting, Pasta on May 18, 2013 by Moira Were AM.